In my research of Kathryn Roahrig Bradford’s family, I came across 8 different spellings which indicated to me that this foreign name included a vowel alien to the English language. On one side journey I inspected a naturalization document which included the applicant’s signature. ” AHA!” I thought. There is a German vowel: the umlaut O, the O with two dots over it, the O that sounds like perk or burn. THAT vowel. In most cases one would transcribe that letter into English or French with an “o” followed by an “e”, but many, many transcribers have not followed that rule. Somewhere along the way, my ancestors’ just settled on the spelling R-O-A-H-R-I-G and standardized the family’s name. My ancestors then were probably from an area of Europe that spoke German. That U.S. Federal 1850 census lists Frederick Roahrig as from France; the 1870 census states that he was a native of Alsace. THAT is the clue. Alsace is a region of France that borders with Germany, and has been the site of political turmoil for centuries, rocking back and forth between French and German control. At the time Frederick shows up in Ohio it was considered France. His family may have spoken French, German or a combination of the languages. I am exceedingly happy that fellow family historian, Doug Kreis, has shared his Register Reports with me. THANK YOU AGAIN, DOUG! For included in his massive projects are obituaries, which have some amazing data sets in aggregate. Frederick Roahrig’s parents were Jean George and Eve Gerling Roahrig, born in Buhl, Alsace, France at the turn of the 19th century. They married in Buhl on 31 December 1817 and had six children: Marie Eve, Magdalena, Frederick, George, Salome, and David. All were born in Buhl before 1835. I had found Frederick, husband to Elizabeth and father of John in the 1850 census. Putting this much information together I can conclude that Frederick emigrated from Alsace between 1835 and 1850. Frederick Roahrig was born in 7 January 1827 in Buhl, Alsace, France. 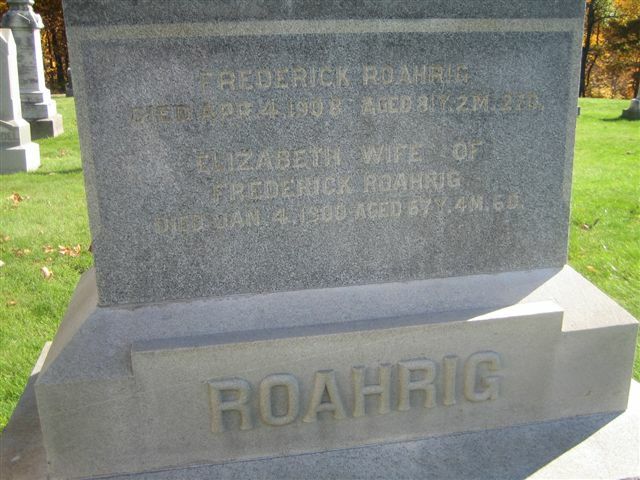 He came to America with his parents and in a few years married Elizabeth Lapp Roahrig (born 26 August 1832 in Muskingum County) on 6 April 1849 in Muskingum County, Ohio. Elizabeth died on 4 January 1900 in Muskingum County; Frederick died in Muskingum County on 4 April 1908. They are both buried in the Zion Evangelical Lutheran Church cemetery. Magdelena Roahrig Reiger was born 22 December 1822 in Buhl, Alsace, France. She was baptized as an infant and joined the Evangelical Lutheran Church of Hatten in 1837. She emigrated to America in 1847 and later that year married George Reiger. She died in 31 August 1893 in Muskingum County, Ohio, and was buried in the Zion Evangelical Lutheran Church cemetery. 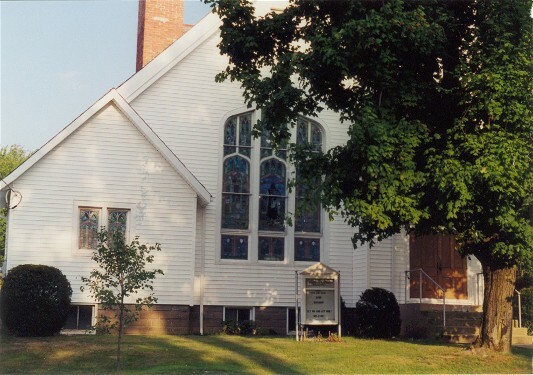 Looking into the history of Zion Evangelical Lutheran Church, Muskingum County, Ohio adds one more important detail: it was founded in 1839 by sixteen, German speaking, Alsatian immigrant families. For now, my family story flows something like this: Jean George and Eve Gerling Roahrig, fed up with the political turmoil of their region and lured by the relative calm of America, emigrated in 1847, with their living children to America. They landed at New York and came up the Erie Canal to Buffalo, then continued on westward to the open lands of Ohio. Or they landed in Philadelphia and moved through Lancaster, Pennsylvania before heading out to the German speaking Ohio communities. There, in Muskingum County, Ohio they were welcomed by the Lapps and the Zimmers, the Mosers and the Kreis’. The children married, and had children who prospered. And I am here, six generations later, to tell their story. Next week: Sing praises for safe travels–in time. Ahnentafels that will lead me to five ancestral immigrants!! Keep sharing the stories, Kay! You would enjoy the Commonwealth Club (of SF) podcast of Laurie David, who just wrote a book about the importance of family dinner to children’s development. It is at table where family history is passed down, and she cites research that indicates the protective effect that family history has on children. Let’s get this book and read it together. Today’s is a story of venturesome folk, travel, European history, determination, and most of all of physical strength. You and yours must plan to live long, which allows greater-than-average risk-taking. I will definitely have a listen to Laurie David’s podcast!! Thanks for the tip, and I eagerly anticipate more conversations with you!